It’s 10:45pm and, finally, the heat is relenting. I don’t know how hot it got today but here in SF we get all bent out of shape about anything 80 and up. The heat is scheduled to continue for the next few days and my tiny fan in the bedroom is probably not going to cut it. All the windows are wide open and baby E is sleeping in only a diaper. But–we do have chilled white wine AND lime popsicles, so we’ll probably be OK.
I’m too tired to write but it’s been too long! E nursed nonstop today and I think my body is depleted of calories. I’m trying to make up for that with some Hint-O-Mint Newman-O’s. The saddest moment of today was when I got my sister’s offer to pick up some In-N-Out burgers–30 mins too late! Now I’m craving In-N-Out like crazy and may have to make a special trip tomorrow. Tomorrow we have Zumba and 9:30 which will probably be inhumanly hot but terribly fun and good one-hour child care practice for E. Then, after probably a nap at home, we’ll take the edge off with a family rec swim in the afternoon. I love these days, and they are sliding past, and the light is beginning to glow with autumn (even if autumn is actually summer). It’s amazing how quickly we slide into the holidays at this time of year. We are in October! The month I go back to work. It’s a big deal. I have so many mixed emotions about it. All in all, I was incredibly lucky to get six months. It’s been glorious. In a few weeks, E will go to the perfect nanny share situation just ten minutes from home and my parents will be here for support and some child care responsibilities as we phase him in! Amazing! Still–moms should get a year off, like in Europe. Seriously. 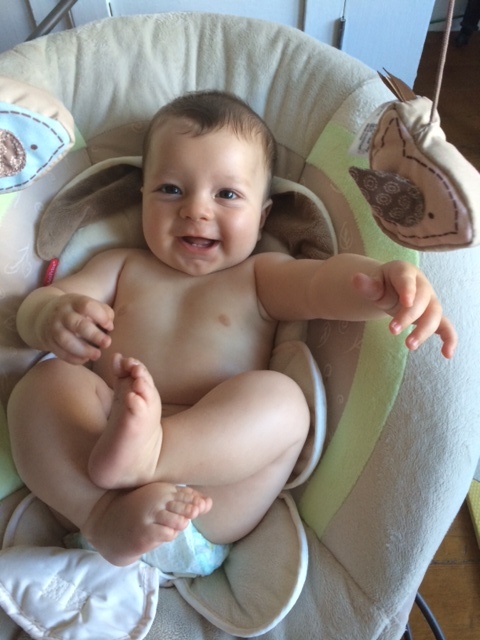 E just grows and grows–almost 20 pounds at 4.5 months and 2 teeth already coming in the bottom! He now reaches up to touch or swat at whatever I’m eating or drinking, and actually pushed a bottle of water out of my mouth so I spilled it all over myself. He rolls onto his belly all the time now, and can even roll back (he looks up at me expecting accolades). He’s doing lots of ab work to prep for sitting up in the near future. Here’s the man with his little bottom teeth. Love and cool breezes to you!